Other names: Gubinge, billygoat, billy goat plum, murunga. 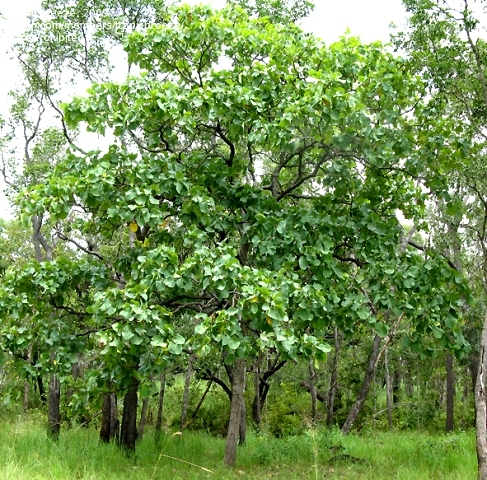 Kakadu plum is a small deciduous tree found growing wild extensively through out the subtropical woodlands of the Northern Territory and the Western Australia. It bears abundant crop of small plum-like fruits but which are not real botanical drupes. This fruit shot to prominence when it was discovered to have a very high content of vitamin C (2907 mg per 100 g according to the analysis carried out by the Food Standards Australia and New Zealand). This is less only to camu camu (Myrciaria dubia) of Brazil. 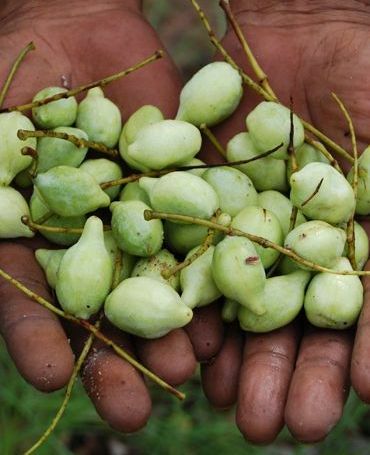 There is great demand for kakadu plum fruits now in Australia from food processing and pharmaceutical companies. A slender, small to medium sized deciduous tree with creamy-grey flaky bark. Leaves light green, very large and oval-shaped, up to 25cm long and 15cm wide, and are spirally arranged and crowded towards the ends of the branches. Flowers small, creamy-white, perfumed, and borne along spikes in the leaf axils towards the ends of the branches. 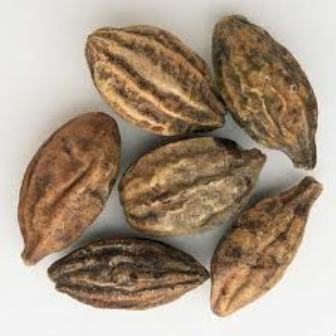 Fruits oval, 3 cm long and 1 cm wide, shaped like almonds and containing a large seed; yellow when ripe, soft and easy to harvest. Fruit are eaten raw but they can have a drying-out effect in the mouth. The greatest use of kakadu plum fruits at present is for gourmet jams and sauces. There is a great demand for these products from restaurants, airlines and hotels. There also seem to be demand for other products like juices, ice-cream, cosmetics, flavours and pharmaceuticals. An Australian cosmetics company has already released a line using kakadu plum extract as a major component. Nutrient Value per 100 g edible portion:- Energy 89 KJ, moisture 76.2 g, nitrogen 0.13 g, protein 0.8 g, fat 0.5 G, ash 1.0 g, available carbohydrate 0.0 g, total dietary fibre 7.1 g, calcium 62 mg, copper 0.900 mg, iron 2.4 mg, magnesium, 40 mg, phosphorus 24 mg, potassium 261 mg, sodium 13 mg, zinc 0.7, thiamin 0.05 mg, riboflavin 0.04 mg, niacin derived from tryptophan or protein 0.1 mg, niacin equivalents 0.1 mg, vitamin C 2907 mg. There seems to be great commercial potential for this wild growing fruit. So this fruit should be brought under cultivation. It should also be tried in other parts of the world besides Australia. The potential commercial market is hard to estimate but could be substantial.